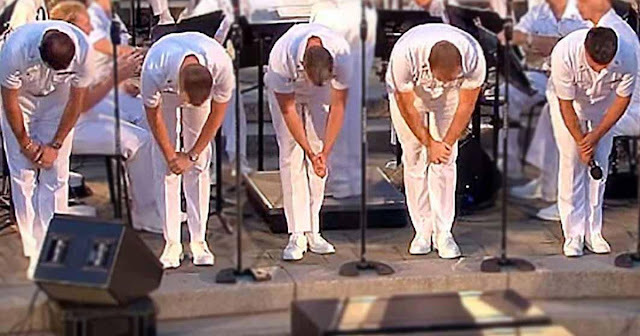 The United States Navy Band Sea Chanters step onstage in front of huge crowd. They are performing as part of the Concerts on the Avenue series at the U.S. Navy Memorial in 2014. They are introduced to the crowd as “The Jersey Boys,” which is confusing at first, but then you hear the music play, and everything becomes clear. These Sea Chanters break out and sing their favorite Jersey Boys songs, and crowd goes crazy! The Sea Chanters progress through a medley of fun, upbeat songs from the 1960s. They sing, “Sherry,” “Big Girls Don’t Cry,” “Walk Like A Man,” “Rag Doll,” “Let’s Hang On,” and “December, 1963 (Oh, What A Night).” It’s a blast from the past, and you can see the crowd moving their bodies and jiving to this awesome boogie music.